Teaching our kids about credit cards is just as important as teaching them how to do laundry and learn to drive. But, it is a topic many parents are discussing. Whether you use credit cards or not, you need to teach your kids about credit cards before they start getting applications in the mail. Part of teaching our children about finances includes budgeting, savings, and credit. We also need to make sure they understand credit and debit cards and how they work. Our kids learn a lot of things in school, but personal finance is currently not one of them. That means this vital lesson is one that parents need to teach. And, if you don’t, they will often make financial mistakes that may last for years. WHAT IS THE RIGHT AGE TO START THE DISCUSSION? There is not a “right” age to start educating your kids on this topic. However, it is imperative that you do so when your kids are old enough to have a checking account. Many kids will get one by the time they are 12 or 13. You may want to even hold onto the debit card until you have the chance to teach them about how it works (just avoid possible issues). Of course, it doesn’t hurt to start sharing with your kids how you use the card at the store. It is easy to explain to them that when you use your debit card, the money comes right out of the bank, but when you use your credit card, you pay a bill at the end of the month. Our oldest is now 13, and we started these discussions a few years ago. She recently got a Greenlight card to get her used to using plastic and managing her money in a controlled environment. You know your kids and how mature they are. If you feel that they are ready at age 10, then start the discussion. However, for other parents, the child will need to be a bit older before those talks commence. A debit card means that the money will instantly be deducted from their checking account. A credit card means they buy now and will have to pay for it later. Just like adults, teens and kids need to know how much they have in their bank account before they shop. It requires them to know how to maintain and balance a checking account. They should also learn how to monitor their accounts online (just to watch for fraud). Also, they should understand that if they use the card at an ATM to get cash. When they get money out of the ATM, it is also immediately taken out of their account. They can’t get more cash out than they have available in the bank. Kids need to understand this as well. As stated above, using a credit card means you get the things you want now, but will need to pay for them later. Each card holder receives a bill at the end of the month that they will have to pay. 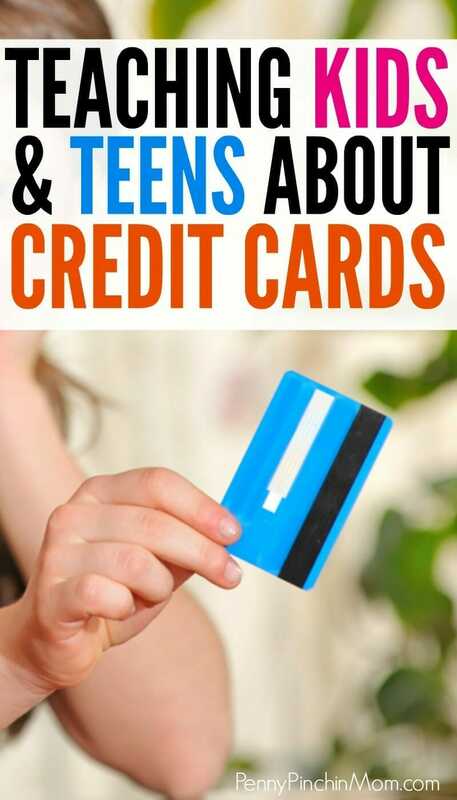 Teens and kids must know that using a credit card is not free money. In fact, it is someone else’s money you are using for a short time. A credit card is an agreement between your teen and the bank that they can use that money for a little while, as long as the pay it back. Your teen needs to understand that while they can make payments to pay off the balance, the longer it takes, the more it will cost. They need to know that $200 they spent this weekend could cost $225 if they don’t pay it all back at once. If your teen doesn’t make their bed or forgets to take out the trash, Mom and Dad remind them. But, that isn’t the case with credit cards. The issuing bank expects payments to be made on time each month. If your teen is late or misses a payment, it will result in late charges. It could also potentially affect their credit score in a negative way, should the issuer decide to make a report to the credit agencies. Explaining this concept is sometimes difficult. After all, we often use credit cards because we don’t have any cash at the moment. The difference is that when responsible credit card owners swipe their cards, they know that there is $50 in the bank right now, which will cover the $50 purchase they are making. Kids have to understand that if you charge too much and can’t pay it back, it means they have to pay interest. Every time you swipe your credit card, someone is watching. They are monitoring how much you charge and if you pay it back on time. These events affect your credit score. Your credit score tells banks and lenders how good (or bad) you are with money. If you continually charge up to your credit limit and are late with your payments, it will result in a negative mark and could lower your score. However, limiting your monthly use and paying it in full and on time monthly, could raise your score. Explaining why their credit score matters is part of understanding responsible credit card use. Teens need to know that if they ever want to buy a car or a house and need to take out a loan, the lender needs to know how they handle money. Their credit score can be the difference between getting approve or not and even affect their monthly payment. Teens make mistakes. Most of the time they are fixable. But, that may not always be the case when it comes to credit cards. And, even if you do fix them, they can haunt you for years. A missed payment can place a negative rating on your credit score. Even if the card is paid in full and then closed, that negative mark does not instantly go away. It remains on their report for up to ten years. Anytime a lender or even potential landlord, for instance, runs a credit report, that negative mark will show. It may not matter that it happened two years ago or not. The lender may decide they do not want to take the risk of you not making your payments on time. Each credit card issuer places a limit on the amount you can charge. Once you reach that amount, you can’t charge anymore. Kids need to learn that they should never charge too much on the card, or they may not be able to use it when they need to. Not only that, a lower balance is more manageable to pay off at the end of each month. And, the bonus is that it tells a lender you are responsible with money, which can help them when they grow up and decide to buy a car or home. Kids need to understand that the best way to buy anything is to use cash or their debit card. They should use these to pay for their necessary expenses and only use credit cards when necessary. There are some different ways to go about educating your children about credit and debit cards. The simplest thing to do is to take them with you when you shop. Allow them to see how you add the items you need to the cart. Then, swipe your debit card. When you get home, go online to your checking account and show your child how the amount that they spent is now deducted from your account. Practice this same thing when you use a credit card. Have your child with you and swipe your credit card. Explain to them that it is a temporary loan. Then, when the bill comes at the end of the month, show them the purchase that they made with you on the statement. Share with them how you are paying it in full every month and never carry a balance. Of course, you don’t want to hand your 12-year-old a credit card to use. But, you can create your own! Find one of your old cards and create a new “cover” for it. Turn this into your child’s debit card. Then, when it comes to allowance time, give them the cash as usual. However, also have your child create a check register, where they can record the deposit. When they want something, ask them to show you their debit card. Then, use your debit card at the store to pay for the item. As soon as you get home, they need to go to their check register and find the cash to pay for the item. Teach them how to update their records to show they bought something, so they see how much they have left to spend. This allows them to see how it truly works. They will see that they were able to use plastic to get what they needed – but they had to pay for it instantly. You can do the same thing with a credit card. However, instead of asking them to hand over the cash at that time, have them (and you) keep a running total of what they are spending for the month. They should make sure they watch their account so that they do not overspend more than the amount they have in their account. At the end of the month, hand them a bill for what they owe. They will need to go to their cash account and then hand over the full amount due at that time. This helps them understand how they can use it to get things they need. The difference they will see is that they pay you once a month instead of it being instant — but that they still need to track their spending, so they don’t spend more than they have available! Once your child has a grasp of how to use debit or credit card, it’s time to get them into the real world. You can start with a gift card to get them use to swiping and monitoring how much they have to spend. Another option is a real debit card, that is safe for them to use. Using something such as Greenlight is one option. As a parent, you get complete control of their card, right down to where they spend and how much. They have the chance to learn about credit and debit in a very controlled environment. You take the time to teach your kids how to do laundry, about the birds and the bees and how to be a good person. Make sure that you don’t forget the importance of finances too! It is just as important as other topics.